SOME 1,060 fans were treated to a six goal thriller in a persistent downpour at New Douglas Park as play-off hopefuls Hamilton Accies and Dumbarton drew 3-3. Accies started brightly, with star striker James Keatings opening the scoring in just three minutes. It was not until the 27th minute that the visitors equalised with a Jordan Kirkpatrick volley from a narrow angle. Both sides attacked as relentlessly as the rain poured down, but the next goal had to wait until the 67th minute before Sons skipper Andy Graham helped a Stephen Hendrie header into the net. Hamilton replied with a spell of pressure and Keatings netted his second goal despite a good initial save from Stephen Grindlay. With three minutes to go Accies new striker, the experienced and portly Jason Scotland, was first to react and netted when Grindlay could only parry a shot. They thought it was all over, but in the final minute Sons goal-a-game on loan striker Chris Kane rose to head home another equaliser. It was a fair result, as neither team deserved to lose after their all-out effort in dreadful conditions. 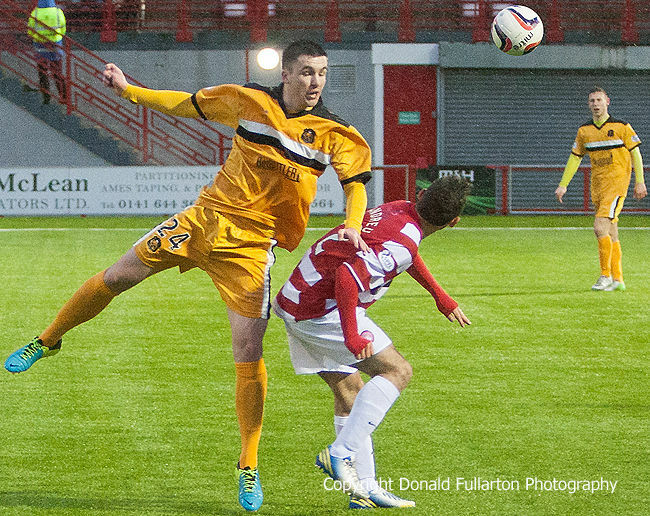 The picture shows Sons new loan signing from Celtic, defender Michael Miller, heading forward.